Yep. Apparently, despite the fact that they are toddlers and cannot read or write or even reason beyond “Oooh shiny! Let’s eat it!”, they are all capable of writing Valentines (complete with treats) to the Littlest Brewster. 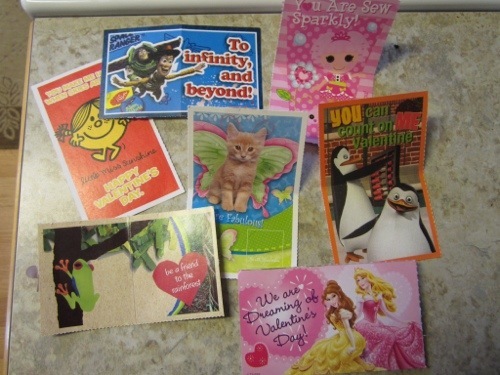 Being the parents without a clue, we did not get Valentines for the other little beasties in her class. Hopefully our daughter won’t be shunned for not bringing 2×3 pieces of kitschy paperboard and high fructose corn syrup treats for her classmates. Although, I will say, one of her classmates had a total score with the pink plastic sunglasses. LB really enjoyed those! This entry was posted in Babies and tagged Holidays, LB, Valentine's Day by BrewsterMama. Bookmark the permalink. My jaw dropped when I saw those Valentines. What’s next, delivering cards and treats in utero? Granted, Suzy did get a flower yesterday from Daddy. (She recoiled in disgust every time we brought it close to her nose). Liesl sure is rockin’ those shades, though! Wow, I don’t think it would occur to me to do Valentine’s at such a young age either (I was never a fan of doing them in elementary school myself!) 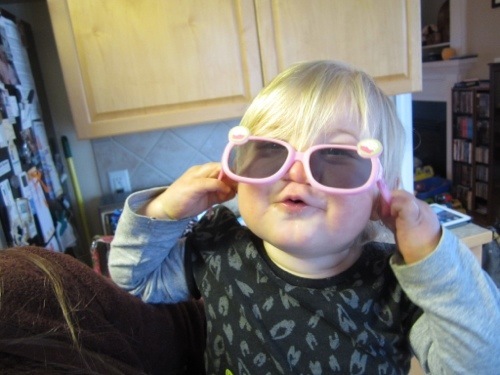 Those pink sunglasses are adorable though! I think she looks like Elton John with them on!